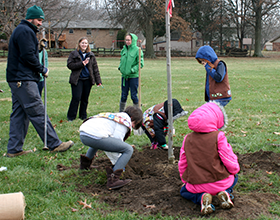 The Centerville-Washington Park District staff plants mature size trees each year to help replace trees that have been lost due to disease or storm damage throughout the district’s 50 parks. Trees that are donated through the Tree Dedication Program are also planted at this time. This winter, 85 trees of various species are being planted. The late fall and winter months are the ideal time to plant mature size trees. The trees are dormant and don’t require watering and care over the winter.